Most people have only used one or two types of keyboard before. There are actually many ways to make a keyboard, and some are better than others. Unfortunately, better designs do not always win the day. As much as anything else, economics has determined the keyboard designs that ended up being widely used. The kinds of differences involved may seem small to some people. These are subtle differences, like the sound of a key when it strikes the tray, the tactile feedback of key actuation, and the distance you have to push the key for actuation. For someone who only uses their PC to check emails or watch YouTube, these kind of features are totally unimportant. But for someone who spends hours in front of their PC programming, gaming, writing, or otherwise pecking away at their keys, the differences can be astonishing. Cheap keyboards are usually made with a rubber dome design because they’re inexpensive to make. Rubber dome keys have a distinctive squishy feeling to them, and generally require you to bottom-out each keystroke in order to generate actuation of the key. The Fujitsu Realforce R2 Keyboard actually makes use of Topre switches. Topre is a Japanese company most noted for their highly sought after and rather unique keyboard switches. Their design is a hybrid between several different technologies, mixing both mechanical and non-mechanical aspects of design. The switches are an integral part of the board, though naturally it’s important to look at the board itself. The Fujitsu Realforce R2 Keyboard measures 18 x 5.6 x 1.2-inches, about four inches longer than the tenkeyless version of the board. This deeply black keyboard and its keys are smoothly rounded with a matte finish. There are actually two versions of this board, this is the Fujitsu Realforce R2 Keyboard Full. That means it includes a complete numerical pad. As a full-sized keyboard, the R2 does take up a fair amount of desk space. If you’d previously been using a tenkeyless keyboard, then it’s worth making sure your mouse has enough space for the new board. But outside of its extra size, the layout of the board is quite standard. Realforce labeled the menu button with a Windows icon, which some people will consider a minor complaint. In the upper right corner of the board, Realforce has highlighted their logo inside a beige rectangle. Whatever you think of the aesthetic, this highlighted area gives the Realforce R2 Full a certain character. Even though the board itself is black, each keycap is dyed with a dark, near-black ink. It’s not quite as severe as removing the lettering from the keys altogether, but it’s close. This helps give the Realforce R2 Full a rather distinct style. 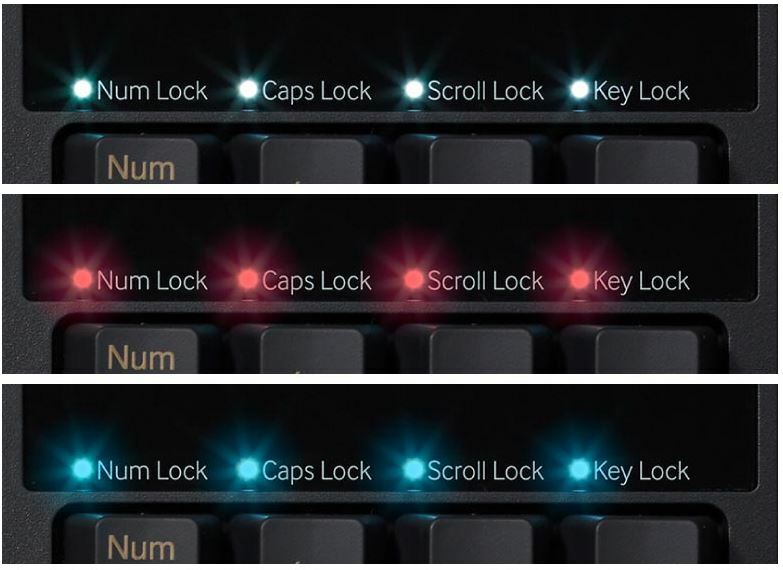 It’s highly discreet in an age where most keyboards seem to be lighting-up with LEDs. Basically any good keyboard over $50 will have some variant of n-key rollover. The full Fujitsu Realforce R2 Keyboard makes use of n-key rollover as well, so you can basically roll your face across the keyboard and never have to worry about missing an input. Not even an accidental input. Though Fujitsu isn’t a hugely popular name in keyboards, it’s actually a fairly well respected brand, and the board was clearly engineered by someone who knows what they’re doing. It uses a step-sculpture design, gently raising and lowering each row of keys, which can facilitate smooth motion for your fingers. Though these minor differences in distance can be literally hard to see, they make a difference to our fingers. Another prominent feature of this board is the result of its Topre switches. The Topre switches allow you to create variable actuation point settings. Using mechanical switches, nearly the only thing you can do to change actuation is shove some O-rings under your keycaps. With these switches, you can quickly move between actuation point settings, ranging between 1.5mm and 3.0mm. Once again, this range seems small. But it’s basically the difference between gently tapping the key, or having to bottom out the key to achieve the actuation you’re looking to get. It covers nearly the entire range of motion of the key. Without getting into gritty details, Topre switches can be tough to understand. That’s because they’re actually a bizarre hybrid of several different designs. Similar to a rubber dome keyboard, Topre switches use rubber domes that are depressed by keycaps. When you’re pressing into one of the keys on the Fujitsu Realforce R2 Keyboard, you’re really pressing against these rubberized domes. But the dome isn’t doing actuation for the board. Lurking under that dome is a capacitive sensor and a spring. When you press down on the dome, the spring is compressed as well. 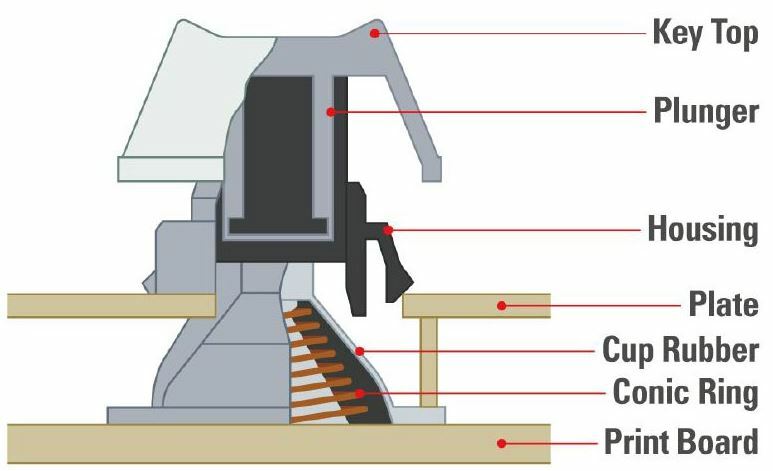 When the spring is adequately compressed, as dictated by your actuation settings, the sensor will pick-up the compression of the spring and actuate the keystroke. As a result, it’s actually kind of hard to determine what to call this keyboard. After all, it uses mechanical parts, like a spring. But it also uses a rubber dome, and a capacitive electrical sensor. All three are necessary to the design, so “hybrid” seems like the only way to describe the Realforce R2 Full Keyboard. If you’re interested in comparing the Fujitsu Realforce R2 with a common mechanical keyboard, the force required for actuation compares with Cherry brown switches. Those are among the most common mechanical switches, so if you’ve ever touched a mechanical keyboard before, then you probably have a good idea of what to expect. Each key really only requires a gentle nudge in the right direction. But the feeling of Topre switches is tough to describe to people who are not personally familiar with it. When you’re using a basic rubber dome switch, your fingers are essentially forced to bottom-out each keystroke, over and over. Topre switches have more of a bouncy feeling to them. 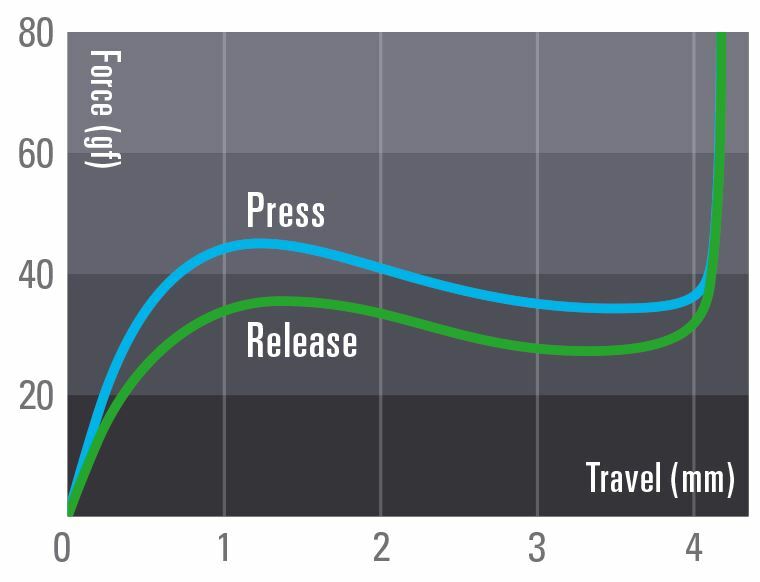 Similar to pressing into a spring, but with more of an urgency in how the key responds. This bouncy feel to each keystroke is really what draws people to these switches. On most keyboards, respectable mechanical switches will be able to offer anywhere between 20 million and 50 million keystrokes before the keys will fail. Fujitsu Realforce R2 Keyboard will carry you through about 50 million keystrokes. To put that into practical terms, you could write thousands of words every day for multiple decades. Saying this board will last a lifetime would only prove to be an exaggeration about half of the time. The Fujitsu Realforce R2 Keyboard is built with keycaps which are made from PBT plastic. Most keyboards use inferior ABS plastic because it’s cheap and it gets the job done. But ABS plastic will quickly develop a polished sheen as it receives regular contact with human skin. The glossy appearance is joined with an oily texture, a result of literally polishing the board with your hands. PBT plastic manages to keep its texture, and also resist the development of that glossy appearance. Without breaking into a chemistry lesson, that’s because it holds up better against chemical interactions. Which also makes it safer to use ordinary household cleaning chemicals on your keys, which isn’t true for ABS plastic. If you’re not an enthusiast, then you’re probably unaware that PBT is fairly expensive compared to ABS. Even though our intuition is small bits of plastic should be cheap, the manufacturing process behind PBT is far more complex. That’s why even entry-level keycaps made from PBT will cost about $50, assuming you’re purchasing from a respectable manufacturer. Compared to ABS, PBT has its own distinctive sound. If you’re not familiar with how it sounds, it’s not tough to find comparison videos on sites like YouTube. These kind of differences seem small, but if you’re listening to your keyboard for 8-hours a day, the sound it makes might matter to you. Texture isn’t the only thing that your fingers wear away from keycaps. Lettering across keys may also gradually wear down, depending on how the lettering was placed to begin with. 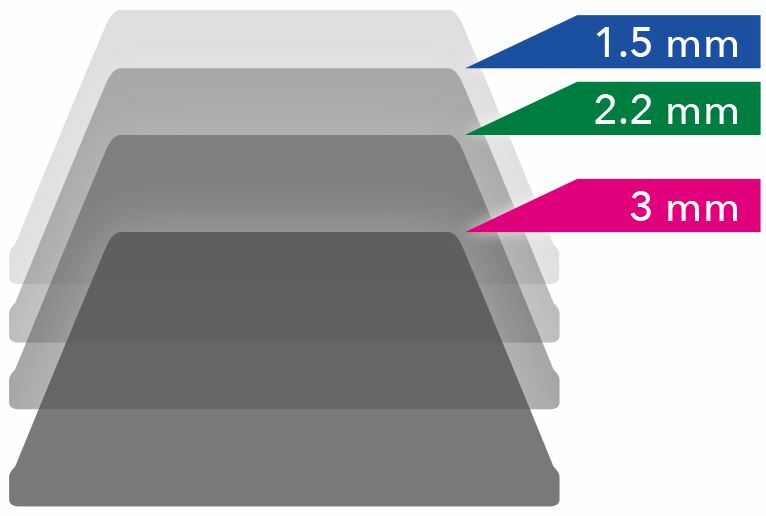 The Fujitsu Realforce R2 Keyboard labeled its icons with a process known as dye sublimation. The general idea is to create a permanent stain on the plastic. If you took a carving knife to the keyboard, you just might be able to scrap off the stain. Short of that, your fingers will never wear out the dye. They would sooner rub the color off asphalt. Japan is known for high quality manufacturing. Both Topre and Fujitsu really puts that into perspective. If you have problems with this board, those problems are almost certain to be rooted in matters of taste and preferences. Some people prefer backlit keys, others prefer classic keyboards. The Realforce R2 Full and its lack of KEYs is part of what makes it so stylish. Someone who’s using a board this sophisticated is probably not looking down at their keyboard all that often. It can be tougher, but far from impossible, to find special keycaps for Topre switches. The way keycaps connect to the keyboard is unique from one type of switch to the next, and even from one manufacturer to the next. You need keycaps designed specifically for Topre switches. Though because PBT keycaps are used in the original design, only a few enthusiasts will feel driven to change the included keycaps. Who Should Choose the Full Fujitsu Realforce R2 Keyboard? Ultimately, the differences between various switches is terribly subjective. Some people will try mechanical switches and develop a preference. Some people will try Topre switches and never be able to use anything else again. The Fujitsu Realforce R2 Keyboard is easy on your wrists because it requires actuation force which compares to mechanical switches. Made widely adaptable with variable actuation, these switches are particularly attractive to typists and gamers. Sadly, the best feature is something you can’t actually experience until you’ve tried the keyboard. And that’s the bouncy feel of the Topre switches. Those limitations aside, the Fujitsu Realforce R2 Keyboard Full is a great choice for someone who spends countless hours working behind their PC. Programmers, writers, and gamers will all find something to love.